Barber lives in Great Barrington, Massachusetts. She was born in Oregon in 1941, and graduated from the Museum Art School, Portland, Oregon in 1963, where she received full scholarship. She has studied with Louie Bunce, Michael Russo, George Johanson. She has exhibited nationally, and her commissions include two major commissions for The Carnival Cruise Lines. The first was nine huge murals that adorned the central staircase landings of the 2974-passenger superliner “Freedom,” that debuted March 5, 2007, portraying recreational aspects of the 1940s post-war American culture, reflecting optimism and hope for the future of that era. Barber’s murals were so successful, she was asked to create ten murals again for the aft stairwell of the 2008 Splendor ship, the largest fun-ship ever constructed. 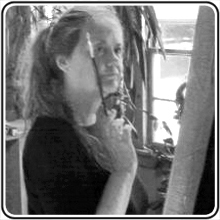 Joan Barber's work is in these public collections: Portland Art Museum, OR; Hancock Shaker Museum, Pittsfield, MA; JMW Consultants Inc., Stanford, CT; Iredale Mineral Cosmetics Ltd., Gt. Barrington, MA; Peabody & Arnold LLP, Boston, MA; Enid Zuckerman, Canyon Ranch, Lenox, MA and Tucson, AZ; Carol Gilligan, Harvard University, Cambridge, MA, as well as in numerous private collections around the world.